SHAH ALAM (Sept 12): Nasim Sdn Bhd, a wholly-owned subsidiary of the Naza Goup, said the newly launched Peugeot 3008 SUV will make up about 22% of its total targeted sales of the year, which has been lowered to 1,800 units for the year. At the launch of the SUV today, Nasim senior general manager Yasser Awan said the sole distributor of the marque expects to sell some 400 units from September to December this year. "The new Peugeot 3008 SUV is pivotal in boosting our sales this year. We are looking at a sales volume of 1,800 units for the year, out of which the new SUV has a sales target of 400 units between now and December. This contributes to about 22% of our overall target and growth," he said. Yasser said the group has secured in excess of 200 bookings prior to the launching of the new model. He said the company is confident of meeting its sales target for the year, which will be driven by new product launches and network expansion plans, but did not elaborate. "We have also introduced a full five-year warranty for all our models, together with Nasim's existing 24-hour Peugeot assistance service and complimentary access to Sky Lounge at Sky Park Subang to provide the best ownership experience for our customers," added Yasser. However, it is noted that the sales target is significantly lower than the company's initial targeted sales of 2,500 units, which was announced by Naza Corp Automotive Group chief operating officer Datuk Samson Anand George in January. For comparison, Nasim achieved total sales of about 1,700 units in 2016. 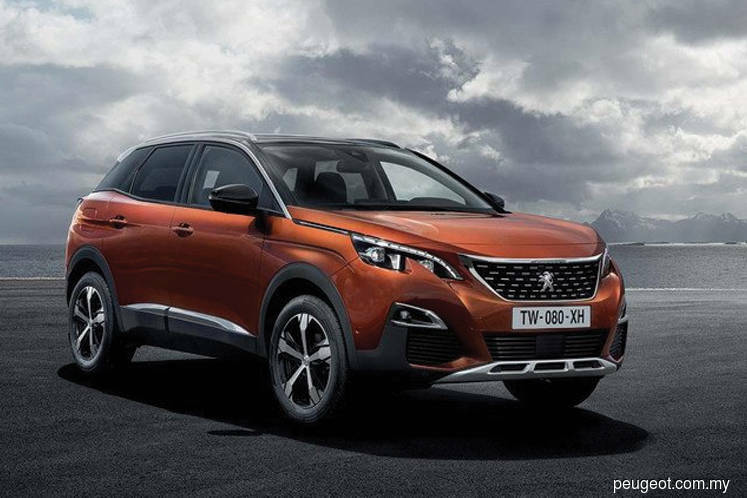 The new Peugeot 3008 SUV comes in two variants which feature different trims, namely the 3008 SUV Active and 3008 SUV Allure. The Active and Allure variants are priced respectively at RM142,888 and RM155,888 on the road, without insurance. The SUV is available in five colours, namely Metallic Copper, Magnetic Blue, Amazonite Grey, Ultimate Red and Pearl White. First unveiled in Europe last year, the Peugeot 3008 SUV was awarded the "European Car of the Year 2017" at the Geneva Motor Show 2017.